On Saturday 26th January over 200 people took to the streets of Halesowen to demand the reinstatement of four members of the Maths department who had been sacked. On a cold day, with snow on the ground, there was a fantastic array of banners and placards showing how far people had come to express solidarity with the Halesowen 4. Music and speeches made for a carnival atmosphere as trade unionists, educators, students and members of the local community assembled outside the gates of Halesowen College. The reason that these sackings have caught so many peoples’ attention was highlighted in many of the speeches. Educators realize that if these unprecedented dismissals, based solely on student outcomes, are allowed to go unchallenged then no teacher is safe. Any college, school or university can ignore local and national agreements and tear up contracts because they can apply any arbitrary measure to isolated sets of student results, ignoring other outcomes that may not suit their purpose, in order to justify sacking staff. This notion of sacking at will is not only a very real fear in education but across all areas of working life and that is why there were so many different unions on the march showing their support. UCU, NUT, Unison, NASUWT and PCS along with Dudley, Wolverhampton , Shropshire and Telford Trades Councils are just a selection of those who attended that I can remember. We now have to wait for the result of the UCU ballot for industrial action within the college, due out on Monday 28 January. I hope that my colleagues have found the courage that they have shown me so often in the past to stand up to the bullying management at the college. If the result is for action then they can be confident that they will have the support of the union nationally and from the wider labour movement. Brilliant turn out and shameful of the BBC to say it was 30 - look at the length in that picture above alone! This really could be any of us, particularly in education, so it was great to see so much solidarity with the Halesowen 4. 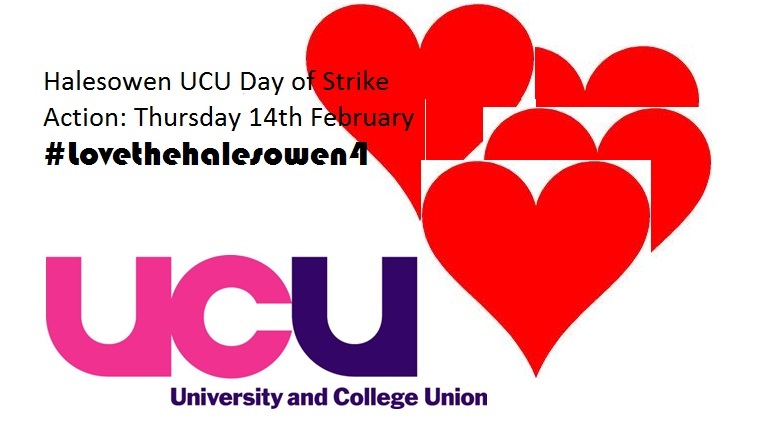 Members of UCU at Halesowen College will take strike action next Thursday (Valentine's Day) as part of their increasingly bitter dispute over the sacking of four maths lecturers. The row started with the dismissal of maths lecturer and UCU branch chair Dave Muritu days before Christmas. Since then three other maths lecturers (also active union members) have been sacked and lost their appeals three of them this week.. In last week's strike ballot, three-quarters (75%) of UCU members who voted backed the call for strike action. 'Staff at Halesowen will be on strike next week because of the way the college has dismissed staff. It simply cannot treat people like this and use them to mask its own failings. 'At all the appeals the employer did not have enough evidence against the individuals to dismiss them and used students' failure to achieve certain levels of attainment as the basis for sacking them. Not only is this unfair, but it threatens all lecturers' jobs at the college. So it does actually seem like this is a union branch capable of organising a strike. Do we know if there's a history of strike action in the branch? Does much initiative come from the rank-and-file or is it a just a dedicated group of lay/local reps? How about the other unions on campus? I can presume members are instructed to go to work, but have there been individual and/or collective refusals to cross picket lines?